Today I’ve got some great news concerning my hunt for an Amiga CD32, as I’ve purchased a unit from a seller in the UK. Already looking forward to the machine arrives in the post! 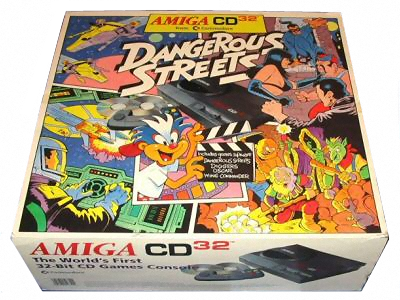 The Amiga CD32 - Dangerous Streets Bundle (taken from Amiga History Guide at http://www.amigahistory.co.uk/dangstreet.html). Not exactly Commodore's best choice of games in my opinion. It didn't get many good reviews, that's for sure. I’ll let you know when the console arrives and will of course take some pictures of it and publish them here. Have a good retro gaming evening everyone! Lucky you! Sadly this is one of those before you have to go back to work evenings. 😦 At least I got some Amiga work done this weekend. Wow, you are really a lucky one, i never had the CD32 back then, had an Amiga 2000 though and loved the old times. The Amiga 2000 was a fine machine. Tons of cool upgrades for it. Which systems are you into now? Well done mate, such a great little system, hope you have fun with it. Thanks mate. 🙂 Will post pictures as soon as it arrives.